True cultural diversity, much celebrated by the Left as a concept but often absent from the enclaves inhabited by financially well-to-do liberals, is a result of great capitalist wealth-building with low barriers to job and housing creation. The liberals who have multiplied like prairie dogs in Austin spend much time worrying about being diverse and having a truly multicultural city but, in reality, have crowded out much of what they claim to desire by adopting policies which make housing so expensive that minority and non-minority natives have been pushed out of the city-proper. They’ve adopted policies which favor the creation of high-tech, high-paying jobs only because anything else would be more related to industries seen as dirty and anti-progressive. 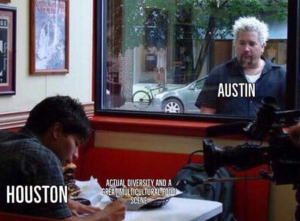 Austin progressives are really bothered of late by a captioned image created by cable-TV food show host Guy Fieri. In the image Fieri is looking into a restaurant from outside. 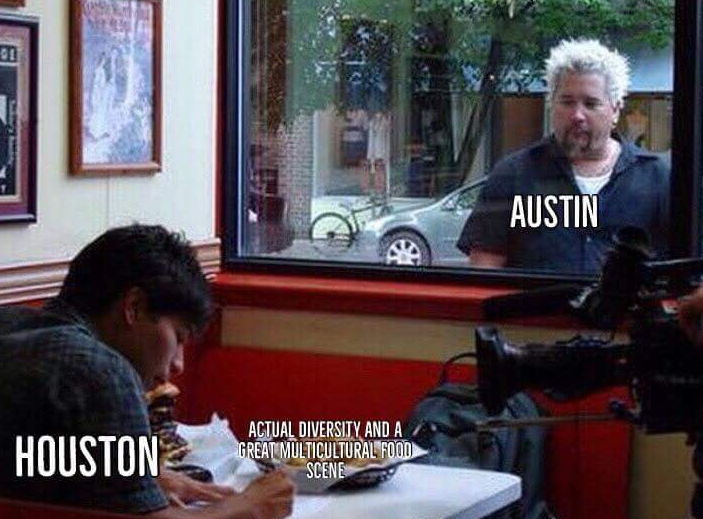 At the table is a diner labeled Houston with a plate of food captioned “Actual diversity and a great multicultural food scene.” Fieri, on the outside sadly looking in, represents Austin. Cities throughout history that grew fast with people from all over the world, in other words truly diverse, did so because of the riches created by aggressive trade of a capitalist nature and where policy was set to encourage more trade and growth as well as allowing for plenty of housing for those coming to work and trade. While anti-capitalist, so-called progressive liberals, sit around in Austin coffee houses and talk about being diverse, those dirty low-regulation pro-growth capitalists created such in Houston.